Happy Birthday Chainsaw Toxic Toons Spooky Greeting Card [TxT007] - $3.99 : Mystic Crypt, the most unique, hard to find items at ghoulishly great prices! 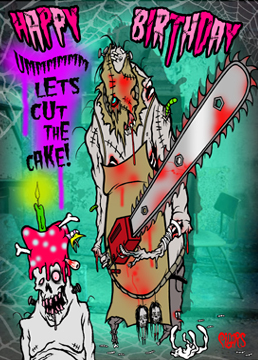 Happy Birthday Chainsaw Toxic Toons Spooky Greeting Card. Cards measure 5 inches by 7 inches, and come with envelope. Each card is sealed inside clear bag for protection. Design work done by Toxic Toons, all done with high quality art with thick glossy card stock. Looking for a spooky greeting card to send? Look no further! 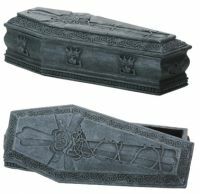 Great for that Gothic or eccentric friend you can never find a card for. Cards for almost any occasion; Birthday, Christmas, Valentine's, Get Well Soon, and many more styles available! These cards are one of our favorites!